Shooting began in April of 2002 at the Grand Opening of the International Bluegrass Museum in Owensboro, KY. Additional footage was shot on location in the buses of the pioneers, at their homes and backstage at bluegrass festivals across the US. Release date: July 22, 2013; run time: 84 minutes. In early 2002, I was sitting in my office in Brooklyn and realized what a loss the bluegrass community had suffered recently with the deaths of so many legends like Benny Martin, Jim McReynolds, Ola Belle Reed, Pappy Sherrill, Jimmy Stoneman, John Hartford, and Bill Napier to name a few. I remember saying to my partner, Tina, “It’s a shame that all of these pioneers of bluegrass music are passing away and their stories may never be told.” And we got to thinking about all the unsung heroes of bluegrass that have died, with barely a ripple in music circles. What stories would they have told about the early days, about the big name stars, about their love of this music? So we thought it would be amazing to be able to talk to these remaining pioneers and share their thoughts and insights with future generations. When we received an invitation from the International Bluegrass Music Museum for their Grand Opening in April of 2002, we realized that was a perfect opportunity to kickoff the interview process with some of the first generation bluegrass greats. Since I had no filmmaking background, I contacted a friend in the film industry to help and off we went to make a splash in bluegrass history. We took a roadtrip down to Owensboro KY, and with a handheld video camera, started interviewing and filming legends that had gathered together to support the museum dedicated to the preservation and promotion of bluegrass music. Then we started contacting pioneers in Nashville and surrounding areas, going to their homes, riding on their buses, and talking to them backstage before performances. Everywhere we went, we were not only welcomed but embraced…they wanted to share their stories and their love of this music. One of the most important excerpts from this film is an interview with Patsy and Donna Stoneman from the Stoneman Family. Few people realize that before the Carter family, there was Ernest “Pop” Stoneman, his wife Hattie, and their family. Their music spanned old time country music to what eventually became known as bluegrass. The Bristol, TN sessions from 1927 are often credited as the earliest country recordings. But starting back in 1924, Ernest Stoneman had already cut two unissued songs for Okeh Records followed by more than 100 other recordings over the next 3 years, including string band standards such as Old Joe Clark, John Hardy, Don’t Let Your Deal Go Down, The Long Eared Mule, and Going Up Cripple Creek — all prior to the Bristol recordings. Patsy and Donna were visibly upset because Poppa Stoneman wasn’t even in the Country Music Hall of Fame [he was finally inducted in 2008]. They worried that the entire legacy of the Stoneman Family would be forgotten and were anxious to talk to me…to preserve their family history. I remember sitting on the porch of a log cabin in PA with Kenny Baker talking about his music and realizing that his story and his association with Bill Monroe is just as important as Bill Monroe’s story. Kenny worked with Bill for over 25 years, playing longer than anyone else as a Blue Grass Boy, before moving on to release albums of his own. His insights into Bill Monroe’s music and the tunes that he helped Bill create, like Jerusalem Ridge, are some of the rare gems collected by this film. Driving down winding roads back into the hills and bouncing through creeks to interview some of these reclusive musicians, I was struck by how many of them felt that nobody was interested in their story. To see their eyes light up as they talked about their contribution to music they love made it all so real to me. Time after time, they reiterated that one man didn’t create this genre, it was born from the dedication of many old time musicians that took their licks and gave them right back again in the form of their music. After gathering a number of interviews on film, we started thinking about how this should all come together. We found an editor, Joe Coppa, and pieced together a 20 minute preview which was released in 2005 with our CD “Troubled Times”. That sneak peak generated a whole pile of cards and letters from all kinds of people, including Art Stamper’s widow, thanking us for the memories. The outpouring of love and encouragement from the bluegrass community was invigorating. In fact, the International Bluegrass Music Museum even contacted us about contributing to their Oral History Project, which shared many of the same goals that we had for our film. So, we agreed to conduct additional interviews with Frank Wakefield, Walter Hensley, Roger Sprung and Pete Seeger that can now be seen at the museum. In post production, everything that could have gone wrong, has gone wrong. The film industry went bust with the recession and advent of Internet based materials, so funds dried up. Technical difficulties mounted. And then, in 2011, there was the death of my partner, Tina Aridas, who was a huge influence on and a major supporter of this film. One of her dying wishes was that this film would be completed. I’m celebrating 20 years as a bandleader in 2013. My music career is going strong and I’m again collaborating with legendary musicians making the music I love. I want so much to be able to share these interviews with fans everywhere and thought that my 20th anniversary would be perfect timing for the film’s release. Everyone who truly loves this music should want to hear the stories from not just the big names in our business but from the likes of Bill Yates, Art Stamper, Melvin Goins, and Kenny Baker…words preserved now in this documentary, honoring their legacy. 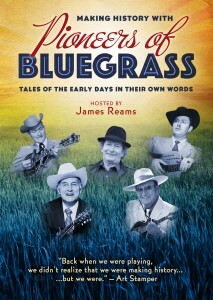 “Making History with the Pioneers of Bluegrass Music” proves that their lives are no less important to how bluegrass got started than the major stars. If you want to hear stories from the heart, captured by a fan and fellow musician, this is a great place to begin.